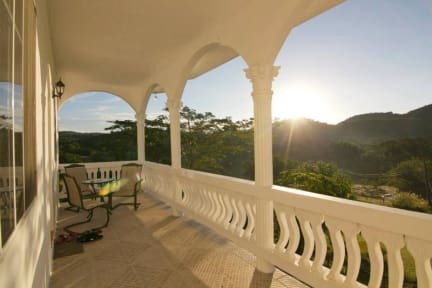 Misty Valley, Montego Bay, Jamajka : Rezerwuj teraz! 14 days cancellation policy. 30 days within the period of November 30 -April 30. Misty Valley is our family home & guest house. 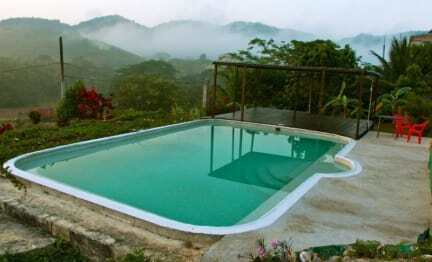 It is approx 7 miles West from Sangster Airport, Mo Bay & situated up in the cool hills. just 7 min drive to the sea & 10 min drive to the river where you can zipline, raft, tube or swim. The humming bird sanctuary is just a 5min drive in the opposite direction. We currently have 2 double rooms & 1 twin room each with a private bathroom & 24 hour hot water. Bed linen is provided, breakfast & evening meals are at an extra cost. We have an outdoor swimming pool, recording studio & optional daily yoga. Complimentary pick up (for bookings of 3 nights or more). We also have (July 2015) a guest kitchen of which we ask a small contribution towards the gas, electric condiments etc. We offer 'off the grid' tours that Ugo would be happy to accommodate you at real 'untouristy prices'. Trip to Roaring River to experience the real life Jamaica. This tour explores caves that were used by slaves as escape routes, Bob Marley & many other musicians for their meditation & jamming sessions, natural jacuzzis, a blue lagoon, crystal clear streams & rivers, an educational walk thru the village meeting locals in their day to day living, learning all about the local herbs, fruits & fauna finishing of with a delicious natural lunch prepared on a wood fire & eaten out of a calabash., a clear favorite among guests. Trip into Kingston - 6am start 3&1/2 hour beautiful scenic drive to the capital ( optional via BLUE MOUNTAINS) Here you can visit the BOB MARLEY museum, & other places of interest. Secret Falls beautiful falls with tubing availed. Herb farm tour. See how it grows & learn all about this healing herb. Dunns River Falls & Chill Out Hut, a great day of water Fall climbing, finishing with a chilled freshly cooked dinner at Chill Out Hut. Cliff diving- at Ricks cafe boasts some of the most daring cliff divers, beautiful cove to swim in whilst listening to a great live reggae band & stunning sunset. Relax whilst being slowly guided down the river on a bamboo raft. If you choose to leave before your departure date, you will be charged for the nights stayed, the deposit paid to HW, plus 1 (one) night stay to cover loss of bookings (full amount will be charged if the dates are within 16th Dec - 3rd Jan) and any other charges occurred.